CBSE result will soon be declared between 25th-31st may,2018. Even board officials have confirmed this news. 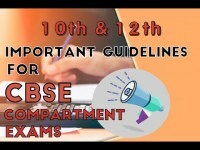 Also one more important news is that, this year results can be checked not only from the official website of CBSE as well as on the Google’s search page. And most importantly, as we all know exam results are quite stressful that is why in this video we have shared few tips with you. THese tips will help you cope up with the anxiety caused due to result. At any cost, all you need to remember is that one event of your life cannot decide what your future holds for you. Success cannot be measured by those double digits, it depends on you, your skills and your passion. Aglasem wishes you all the luck for your board result and may you all pass with flying colors.